Carole-Anne Davies is Chief Executive of the Design Commission for Wales (DCFW). 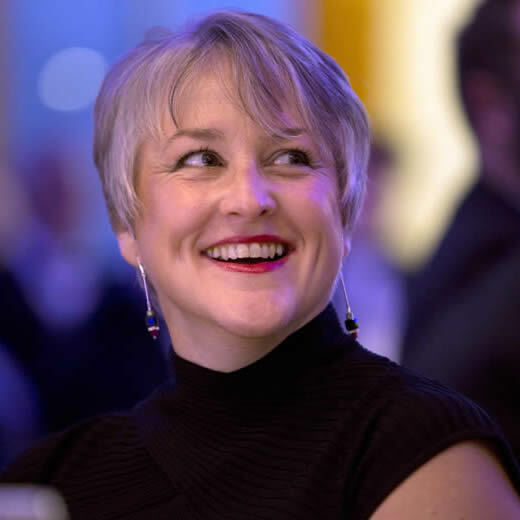 A career predominantly in senior management roles followed her time in industry with Thorn EMI and she held roles as Director of Cardiff Bay Arts Trust; Trustee at the National Museum of Wales and consultant to the Scottish Government. In 2015 she was appointed founding Chair of The Gregynog Trust. Carole-Anne established a co-production business model as founding chief executive of DCFW integrating the expertise of outstanding multi-disciplinary private sector professionals with that of the core staff team. She has worked with three chairs and six Ministers in succession, bringing significant expertise and influence to a wide range of projects in Wales including proposals for Tidal Lagoon Power, BBC Cymru Wales headquarters, Cardiff Central Square, St Fagans National Museum of History, major roads programme infrastructure, the development of Swansea City Centre and ambitious proposals for Cyfarthfa and wider Merthyr Tydfil. She is an alumna of the CSCLeaders Commonwealth International Study Conference, of Harvard Kennedy School Executive Programme and the Cambridge Institute for Sustainability Leadership (CISL). She is an Honorary Member of the Royal Town Planning Institute, Life Fellow of the Institute of Welsh Affairs and an active mentor, passionate about leadership and equality of opportunity. She is also a very, very keen gardener.